Love it or hate it, rose gold and copper are trendy again! 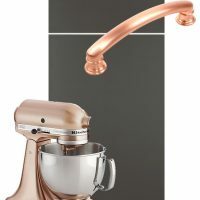 From iPhones to your grandma’s antique watch, we are now seeing this blush metal in light fixtures, hardware, backsplashes, furniture, and even appliances. It is not as timeless as chrome but not as blingy as gold.